We’re getting into the fall food season: acorn squash and more yummy items in the box. Plus this week is Lewis Waite pickups–if you haven’t ordered yet, check out what they offer! The fruit share this week includes Gala apples and nectarines. Baby Arugula – This is super baby sized, and appropriately tender–don’t overdress it. Store in a container in the fridge, use within 3 days. Parsley – Soups just aren’t the same without chopped parsley, and if you don’t have plans for it this week, you can always freeze for later. Store in a container in the fridge, use within 3 days. Green Cabbage – It’s a great time of year for stuffed cabbage recipes. Also great in soup, chopped in coleslaw salads or just eaten in wedges for snacks. Store in a container in the fridge, use within 10 days. 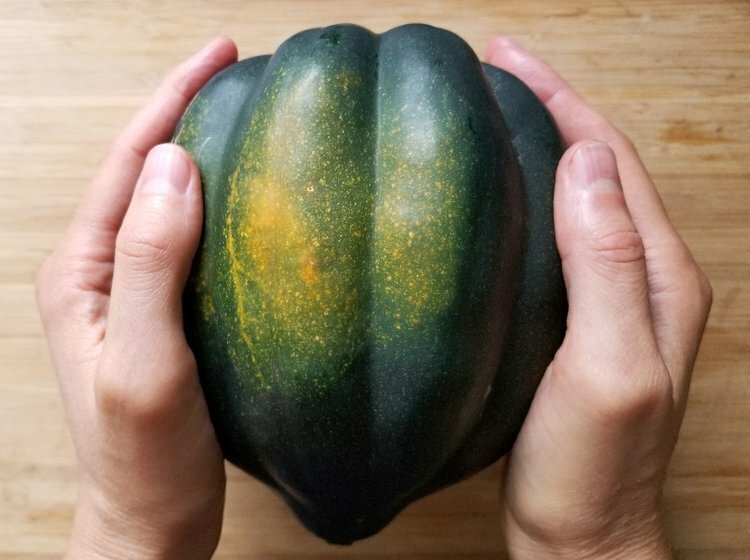 Acorn Squash – To allow some of their NY farmland a rest, Golden Earthworm is partnering with another Certified Organic producer in Massachusetts to bring us these lovely squash. Store on the counter, use within 5 days. Red Tomato – Tomatoes are on the decline now, but you can expect to see them a few more times, so enjoy! Store on the counter, use when they are a deep red. Romaine Lettuce – Crunchy and flavorful for salads. Store in a container in the fridge, use within 3 days.